The main cycle takes place from Saturday 28 April 2018 – Monday 7 May 2018 (bank holiday) and creates a very tangible and practical opportunity for people who want to help support those who are affected by suicide. The route passes through 17 counties & 67 towns and stops at 40 locations throughout the 750 Km route. The Route Schedule 2018 and map 2018 are now officially launched. Registrations will be open by 15/1/18. The Cycle Against Suicide community is determined to let people in every corner of the island of Ireland know that: it’s OK not to feel OK; and it’s absolutely OK to ask for help. 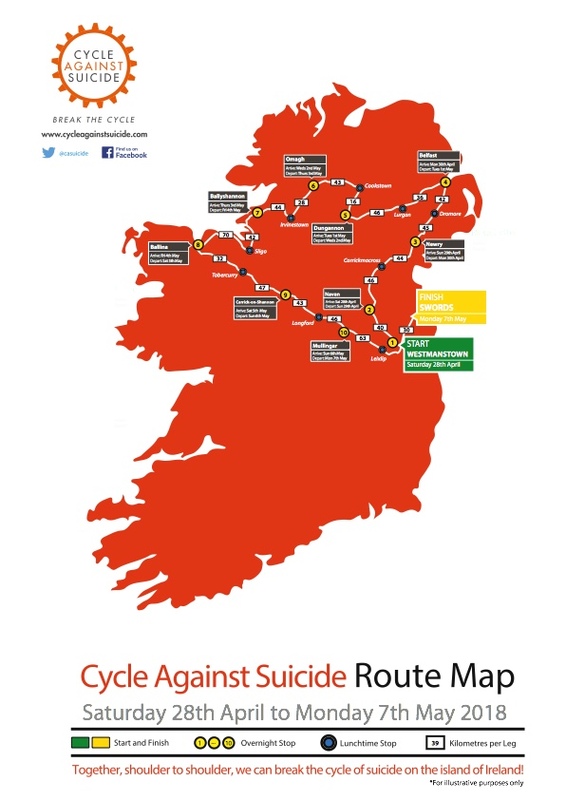 Together, shoulder to shoulder, we can Break the Cycle of Suicide in Ireland!